One way to gauge the sturdiness of a work of fiction might be: if you know the big spoiler, can you still enjoy it? The longevity of Hamlet, Citizen Kane, and The Empire Strikes Back (to name just three) suggest that it’s certainly possible to satisfy this test. 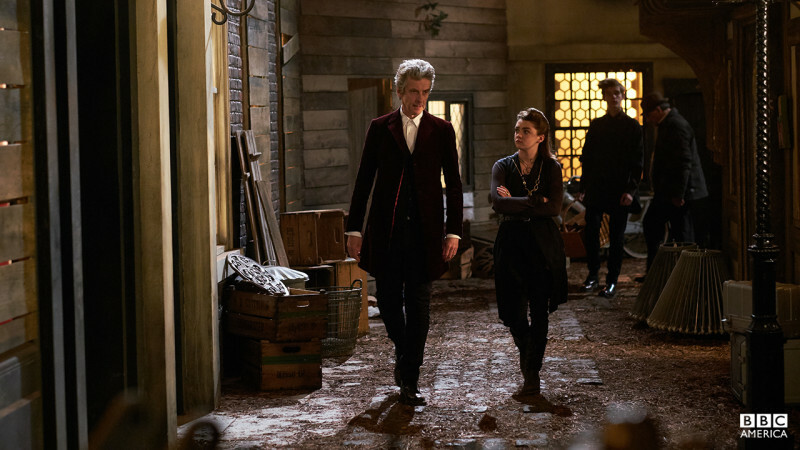 And there’s no way to discuss “Face the Raven” without revealing its massive spoiler, so if you haven’t seen the episode, turn back now. This is a trap street. So how sturdy is this episode? If you know going in, as I did, the general nature of the spoiler at the end without knowing for certain which character it concerns, can you still enjoy it? The verdict, at least for me: kind of. To give a little more space to anyone who might have glanced ahead of the spoiler warning, let’s talk about everything else first. It begins with Rigsy, and a good job too. He’s a ray of sunshine here as he was in “Flatline,” earnest and innocent, full of comic surprise and concern. 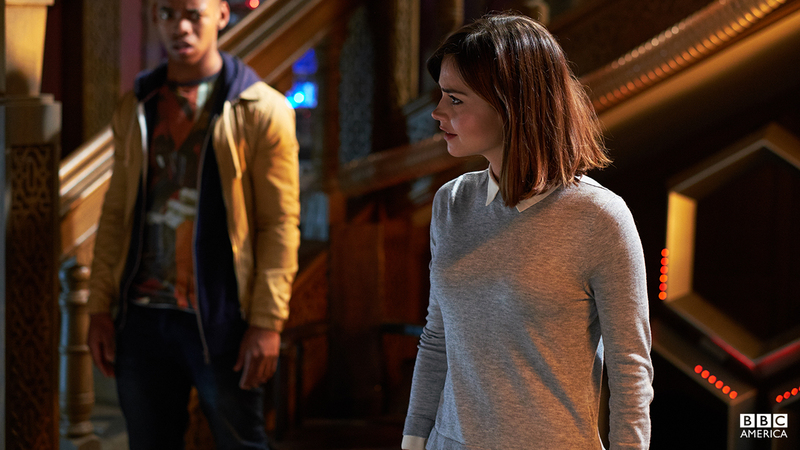 It’s easy to care about the death sentence tattooed on the back of his neck, even without his new family to raise the stakes, and easy to buy Clara’s ability to manipulate him into letting her shoulder the burden he’s been placed under. The sequence where they locate the “trap street” he stumbled into is great fun, a far more charming everyday-magic conceit than the eye-booger monsters from last week. The trap street itself, whose provenance many have noted as Neverwhere meets Diagon Alley, is slightly less charming given its status as an alien refugee camp, apparently a place for injured aliens (mostly “monsters” as far as Doctor Who is concerned) to hide out, recuperate, eke out an apparently grim existence. It’s run by Mayor Me (no relation to Family Guy‘s Mayor Bee, but that’s all I can hear in my head), someone with a peculiar idea about how dangerous the Doctor is to Earth given that she was the one who nearly let a refugee from a Cocteau film destroy the planet just because she wanted to hitch a ride. In a two-parter we might have had more time to flesh out this interesting setting, but here we see it largely as a place of despair and paranoia, which seems like kind of a raw deal compared to what the Zygons got. The substance of our interaction with this menagerie, which includes Cybermen, Ood, Sontarans, bug-headed guys, two-faced psychic aliens called the Janus, and apparently Wolverine’s cousin, concerns the reason Rigsy has a death countdown tattoo: he’s been implicated in a murder. It is not the big spoiler to reveal that he’s innocent, and that apparently the woman wasn’t even murdered (but someone hit her, and Wolverine’s cousin claimed that she, er, smelled dead — was he in on it? ), but the whole thing is a plot to lure the Doctor to the trap street and get him to wear a teleport bracelet. Surely a jewelry store would have made for a less elaborate and suspicious snare? In any case, that’s what Mayor Me thinks the plot is. Steven Moffat thinks the plot is actually to teleport a companion out of the show, and it’s hard to imagine him ceding sole privilege to Sarah Dollard to do this without planning to give Clara his own send-off sometime in the next two episodes. Perhaps he thought he’d be setting himself up for special criticism if he botched the first true companion death of the new series, and thought it would be wiser to ask a woman to do it. Whatever the case, Dollard handles it as well as anyone could have, and I’d love to see her come back and write something for series 10 with less of an agenda weighing it down. I’ve commented before that the new series is unnecessarily squeamish about writing out companions, coming up with all sorts of loopholes and evasions to permanently exile them (with the admirable exception of Martha). It’s not cool to kill them outright, and apparently it’s also not cool to imagine that anyone with access to the TARDIS would ever voluntarily stop traveling in it. Yet in the classic series this happened all the time: companions would eventually discover something that mattered to them enough that they decided to put down roots. Sometimes a family, but often also a cause, like Romana freeing the Tharils or Nyssa helping the Lazars. It was very much the exception for a companion to do anything more permanent than disembark, and in fact the last such exception was Adric in 1982 (which is what “remember 82” portends), killed when the freighter he’s aboard crashes into prehistoric Earth. In a way — assuming she’s really dead, which as we all know is a tough call with Moffat — Clara’s death is brave, a first for the new series. In another, it’s yet another cop-out, yet another companion who would never leave Neverland by choice. But how could she? Clara already had a life she was pursuing between travels with the Doctor — a career, and for a time, a boyfriend. She implies that perhaps her increased risk-taking stems from a wish to join Danny, but she’s always been eager to jump feet-first into situations on almost no information: interrogating the Ice Warrior in “Cold War,” entering the Doctor’s timestream in “Name of the Doctor.” She could have found some cause to live for, even perhaps choosing to settle down with Jane Austen, but it would have seemed like a growing down for her rather than a growing up. So I get why she has to die. And yet there’s so much frustrating about the way it happens. First there’s her exchange with Rigsy, plausible and just like her, and yet so obviously a terrible idea on the level of the horror-flick teen blithely suggesting they split up so she can investigate the spooky attic all by herself. You want to yell at the screen, but if you’re like me, you know Jenna Coleman is leaving the show and you’ve heard someone dies at the end of this, and so from then on it’s just a matter of watching the clock run out. You want to be proud of her, risking her life to save Rigsy’s, but she’s so convinced it’s going to work out fine, she seems stupid rather than brave or clever and it’s hard to be as proud of her as she’d like. And worst of all, everything is a matter of arbitrary law. She hasn’t fallen into a nest of poisonous spectrox or been airlocked by a vicious space criminal; she’s just wandered into a street with draconian rules about theft, and relied on a verbal assurance of safety to save her from a magical executioner who can be controlled by Mayor Me except when it can’t be. She literally dies because of a lattice of legal loopholes. We all would have rolled our eyes if she’d just jumped in front of a bullet or something, but it would have left less room for the sort of “yeah, but…” head-scratching we did after the Angels took Manhattan. To return to the original question: I don’t doubt for a moment that if it were somehow possible in 2015 to be a Doctor Who fan and watch this episode without knowing Jenna Coleman had announced her departure from the show, it would have been more effective. It would have conveyed the message — being clever isn’t always enough to save you — as a sucker punch. But if you’re spoiled, even a little, it’s just a bit of a letdown. Does Clara’s death at least give her a noble exit? 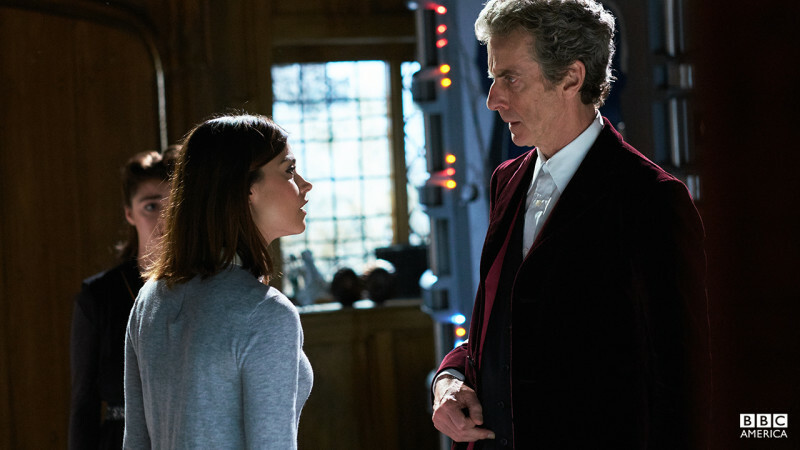 “Let me be brave” is a fine quotable, for sure, but even in death she’s just a little too brave, focusing as she always has on how she wants the Doctor to behave, exhorting him not to take revenge and become a monster in her name. 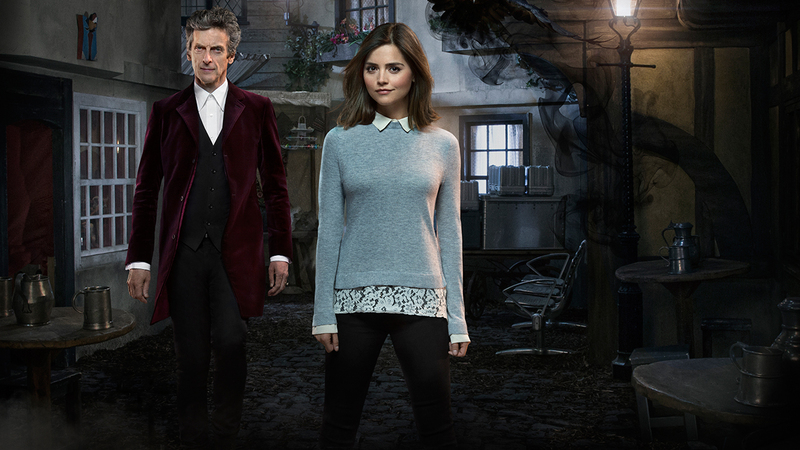 Here this finally looks just a bit like that Impossible Girl who’s supposed to save a man (typically her husband, but this is Doctor Who) from himself, to civilize him and temper his ambition and power with her mercy and compassion. Even if you have no objection to that fantasy of male/female relations, her stoicism is a bit bland; a little too perfect, too selfless and self-effacing. It’s the reason I won’t miss Clara as much as I’d like to. I’ll miss Jenna Coleman, who in every other incarnation — Oswin, the Victorian governess, even Bonnie — proved herself a scintillating and capable actress. But I’m relieved that, apart from a few probably-touching afterwords in the two-part season finale, we may finally close the book on Clara. It wasn’t the worst book I’ve ever read, but I’m ready to move on to something else.